Sev­er­al years ago, a mys­te­ri­ous pack­age arrived at our house on Valentine’s Day: a plain brown box addressed to our entire fam­i­ly with a return address “TMVDP.” The pack­age weighed almost noth­ing. It weighed almost noth­ing because the box con­tained four lunch­box serv­ing-size bags of pota­to chips. Noth­ing else. Or at least I thought there was noth­ing else until I dumped the box upside down and a slim book fell out—Daniel Pinkwater’s Big Bob and The Mag­ic Valentine’s Day Pota­to. Our lives have nev­er been the same. 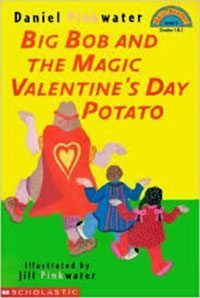 I’m not sure how I did not know about this book before The Mag­ic Valentine’s Day Pota­to vis­it­ed us, but I didn’t. I tell you the sto­ry so you will know. The book is out of print; do not be deterred. It can be eas­i­ly pro­cured. Big Bob and Big Glo­ria are the sec­ond-biggest and first-biggest kids (respec­tive­ly) in the grade. Their teacher is Mr. Sala­mi. He used to be a race-car dri­ver. Also a jet pilot and deep-sea div­er. He’s a good teacher for Big Bob and Big Glo­ria and their friends. But he’s lack­ing a lit­tle oomph and cre­ativ­i­ty around Valentine’s Day. He describes how they will cel­e­brate: They will make and exchange valen­tines and dec­o­rate the room. Big Glo­ria and Big Bob are dis­mayed. Clear­ly, Mr. Sala­mi does not enjoy Valentine’s Day. They decide some­thing must be done. So they ask Mr. Sala­mi if The Mag­ic Valen­tine Pota­to will be vis­it­ing. Mr. Sala­mi is not acquaint­ed with The Mag­ic Valen­tine Pota­to, and so the kids have to explain, which they do on the spot as they are cre­at­ing the details of TMVDP’s reign. TMVDP is a mag­i­cal pota­to char­ac­ter who vis­its on Valentine’s Day, they tell Mr. Sala­mi. He brings valen­tines and pota­to chips to all good chil­dren. He’s a benev­o­lent fel­low, not unlike San­ta Claus. He is Mag­i­cal. The next sev­er­al chap­ters of this clever book (it’s an ear­ly reader—the chap­ters are two to four pages long) show the chil­dren in Mr. Salami’s class work­ing hard to cre­ate a mag­i­cal Valen­tine cel­e­bra­tion for their teacher. They make pota­to print valen­tines and crêpe-paperesque hang­ing dec­o­ra­tions from pink toi­let paper. They get Mr. Willie, the jan­i­tor (and Big Gloria’s uncle), to let them in the school ear­ly so they can dec­o­rate and pre­pare the Valen­tine sur­prise for Mr. Sala­mi. But on the morn­ing of Valentine’s Day, it’s not Mr. Sala­mi who is surprised—it’s the kids. Before Mr. Sala­mi even arrives, a mys­te­ri­ous vis­i­tor appears—a lumpy pota­to-like vis­i­tor in a red cape and mask. The chil­dren rec­og­nize the iden­ti­ty of the vis­i­tor imme­di­ate­ly: The Mag­ic Valentine’s Day Pota­to has come to vis­it! TMVDP announces that Mr. Sala­mi has been detained. He hands out valen­tines and pota­to chips to every child. He dances around the class­room in his benev­o­lent pota­to-like way. “I thought you made him up,” Big Bob says to Big Glo­ria. “I thought I did, too.” Big Glo­ria says. This book is mag­i­cal. I have read it to pre-school class­es and at mixed-age Valen­tine Sto­ry­times and ele­men­tary school par­ties. There are clues in the pic­tures that explain the mys­tery, but none of the rapt chil­dren, no mat­ter their age, fig­ure it out. They are sim­ply over the moon when valen­tines and pota­to chips for the entire group mys­te­ri­ous­ly arrive. My nieces and oth­er folk in our lives are vis­it­ed by the Mag­ic Valentine’s Day Pota­to each year now. It adds a zany twist to Valentine’s Day. And every year, like clock­work, the TMVDP sends a pack­age to our house on Valentine’s Day. My kids have no idea who this mys­te­ri­ous bene­fac­tor is. Bless­ings on her head for intro­duc­ing us to TMVDP. Sounds like a great sto­ry! Thanks for shar­ing.